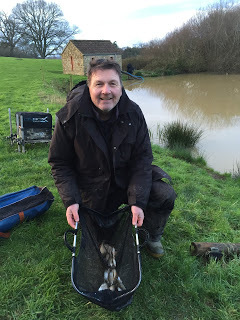 After yet more torrential rain on Saturday Rob had no choice but to put us on the pond again for round five. At the draw, there were thirteen anglers booked in for this one including the Tackleuk baggers Scott and Ash and it was nice to see Terry Morgan back again as he hadn’t fished with us for a while. When it was time to let the draw bag (Rob’s hat) decide our fate, I went in and there were just three pegs left and I was well chuffed when I saw I was on peg 18 for the second match on the trot, Scotty then drew peg 13 for Ash and peg 17 for himself so we were next peg neighbours yet again and for good measure I had Rob on the other side in peg 19. On arriving at the pond, it was chocolate coloured and I hadn’t see it like this for a long time and I said to Scott that it would either fish it’s head off or it would be a right struggle. He said he still thought you’d need 14lb to win today, I was a little more cautious and said 12lb but we both agreed that the first ten minutes would tell us how it was going to fish. There were quite a few fish topping as we were setting up, including three of four big fish that rolled out in the middle. Groundbait for today was a 50:50 mix of Bait-Tech Pro Nat and SSP Baits Dark Silt and on my side tray I had the usual casters, maggots and hemp. I set up the same two rigs I used the last time I was here, a 0.5 gram Drennan Roach for fishing on the deck at ten metres and a Preston Chianti for fishing shallow, both had 0.10mm bottoms with barbless size 18 B611’s. On the whistle I cupped in two balls of groundbait before starting with double red maggot on the hook and was expecting to catch straight away but the rig settled and the float just sat there. Ten minutes later I still hadn’t had a bite and I was starting to think this could be hard going although I had seen Scotty catch a couple of tiny roach. I tried a single white maggot and a few minutes later I was relieved when the float slid away and I swung in a small roach to finally get off the mark. A couple more followed and then I had a nice 4oz rudd on double maggot, I briefly tried caster but with no bites after a couple of minutes I didn’t want to spend too long on it. I landed a nice roach just before the end of the first hour to put me on 14 fish for around 1.5lb, Scotty was a few ahead on 21 but as far as I could tell nobody else was catching much and I heard Ash over on peg 13 say he only had four fish! It was a similar story in the second hour and I added a further 12 fish, mainly roach between 1-2oz but with a couple of net fish amongst them. Mike Board came for a walk round and said nobody was catching much on the other side apart from Fieldy on peg 2 who was catching some tiny roach on pinkies. While he was stood behind me I had a lovely rudd of 8-10oz and a couple of small roach. About half way through the third hour I had to answer the call of nature so asked Scotty how many he had and he said 50 which was a long way ahead of the 30 I had but he did say he had mostly tiny fish and swung in a blip as we spoke. By the end of the third hour I was up to 38 fish for about 4.5lb which as far as I could tell was pretty good, quite a few anglers were swapping between the feeder and the pole which usually means they’re struggling and I could see both Heardy and Bruce fishing the whip and catching the odd small fish. I’d been feeding casters and hemp from the start so thought I’d see if I could catch on caster again, I buried the hook in one, shipped out and the rig settled before the float tip disappeared from sight and another two ounce roach was swung in. This signalled a really good spell and it was a bite a chuck and my catch rate doubled in the fourth hour as I caught another 26 fish and was having to use the landing net nearly every other fish, including a couple of cracking roach and rudd. Scott had slowed right up and I started to claw back his early lead. Some ominously black storm clouds arrived overhead and we had a brief flurry of rain but thankfully it didn’t last too long. My swim continued to get stronger while Scott’s faded and I didn’t think there was much between us as we headed into the last hour. Harry, Jake and Justin on the far bank had really struggled and headed off for an early bath. Ash started to catch quite well and I was hoping he wouldn’t start catching chub like the last time he was on that peg. I set my sights on catching 100 fish which I thought would give me double figures (as the fish probably averaged ten to the pound) but at the final whistle I’d fallen just short with 96 although I had dropped off four! Although Scott had slowed up he’d still finished ahead of me on numbers of fish but he reckoned I’d had more quality fish. We would soon find out as I had the scales although as Rob had packed up a little early he’d offered to start weighing in – cheers mate. He went to weigh Scott in and I caught up with them just as he was taking his net out, his fish pulled the needle round to 8lb 4oz, then it was my turn and those quality fish swung it for me as Rob called out 11lb 6oz and I’d got my revenge for the battering Scott gave me two weeks ago! 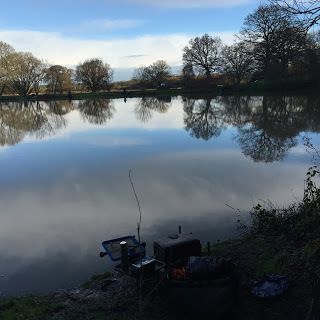 We walked round to weigh Terry who had 2lb 6oz, Rob and Karl didn’t weigh and Heardy had 2lb 6oz from peg 22 which meant I’d won my section again at least, we loaded the cars and waited for the anglers in the other section to drive back round. When they arrived, there had been a bit of confusion during the weigh in, the club had bought some new scales, the kind that you can read the weight in pounds or kilos and in all the years I’ve been fishing, Ilminster AA have weighed in pounds and ounces yet somehow Fieldy’s weight was recorded as 4kgs which we eventually translated as 8lb 10oz, then the rest of the section was weighed in pounds. 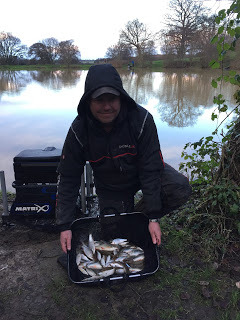 Bruce had 6lb, Ash hadn’t found any chub and weighed 4lb 10oz and Steve P had 1lb 9oz and the other three in the section were probably enjoying their hot baths by now! Perhaps we should have held a training session on weighing in before we started! Although it can’t be that hard as we managed alright with an identical set of scales! So after all that, Rob called me out as the winner and I picked up £55 which was very nice plus a nugget from Steve, Fieldy was second and Scotty third. 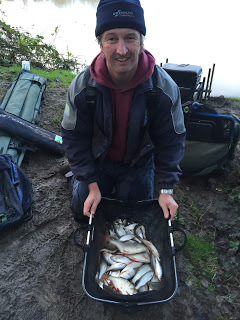 So a really enjoyable days fishing and it was nice to get the year up and running and win my first match in ages. The icing on the cake was another section win in the league which moves me up into second place with nine points although Fieldy is leading with six and will be hard to catch with only two matches left. Although it’s taken me a while, this one’s for you Mum………. Thanks Ivan, it is a cracking venue, right up your street, the rain will stop and then we'll have freezing cold weather to look forward to! Thanks Steve, it took a while! Nice one Jamie. Great start to the year. Interesting mixed fishery. Some nice chub some weeks, or bream or perch or roach. You never really know.